Last month Anne-Marie Bagnall shared about the community wellbeing indicators gathered from across the country for our scoping review. 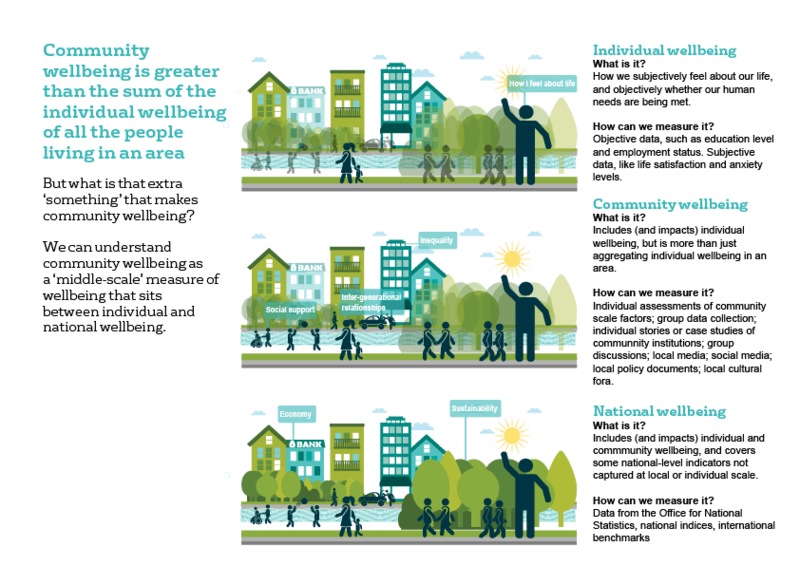 This month, we dive deeper into the concepts behind community wellbeing, with this blog that draws on the Centre’s conceptual review of community wellbeing. or view the briefing slides. Interest in personal, or subjective, wellbeing has grown rapidly over the last few years. There are questionnaires on feelings, workplace policies for ‘wellbeing’, individual techniques such as exercise or mindfulness and commercial products from self-help guidance to mood-enhancing décor. But our day-to-day living is not only as independent, self-directing individuals. We grow up, act, think and feel through our interactions with other people, and wellbeing is, at least in part, ‘being well together’. 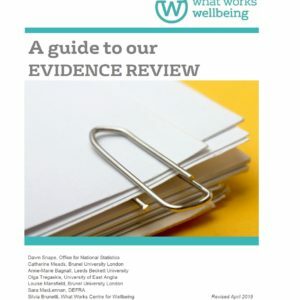 Our review found a number of useful concepts and frameworks for community wellbeing and supports the argument that community wellbeing should capture something that is more than the aggregate of individual parts. If we only aggregate individual assessments, we miss the experience of ‘being well together’ as a key part of our lives, and of community. The exception that does capture the interactive aspects of community is where aggregated individual assessments relate to shared resources, such as the provision of services, the availability of leisure spaces, the sense of safety or belonging and so forth. Deliberative processes, such as group discussions, offer a more nuanced, but non-quantified, approach to how local views are shaped, shared or in conflict and how they are embedded in relationships and communications across local to global scales. We are currently looking for evaluations of joint decision-making in communities to lean more about this aspect of community wellbeing as part of an upcoming review, so do have a look at the call for evidence. However, we found several important omissions in existing frameworks for community wellbeing. Inequality within and between communities undermines claims to community wellbeing and needs to be assessed. There is very little attention to intangible cultural heritage that is core to understanding community. Local histories are omitted, sustainability or inter-generational relations. This is related to the point above. Sustainability- in terms of environment and availability of resources- was only included in two frameworks. Including these aspects in assessments of community wellbeing will enrich our understandings of ‘being well together’. Community wellbeing will mean different things in different communities. To help you navigate this, we have developed these questions to help you think through how to conceptualise and capture community wellbeing in your work. 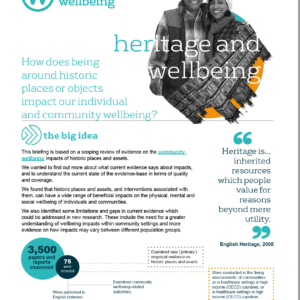 Is it useful for your work to conceptualise ‘community wellbeing’ as opposed to just individual wellbeing? 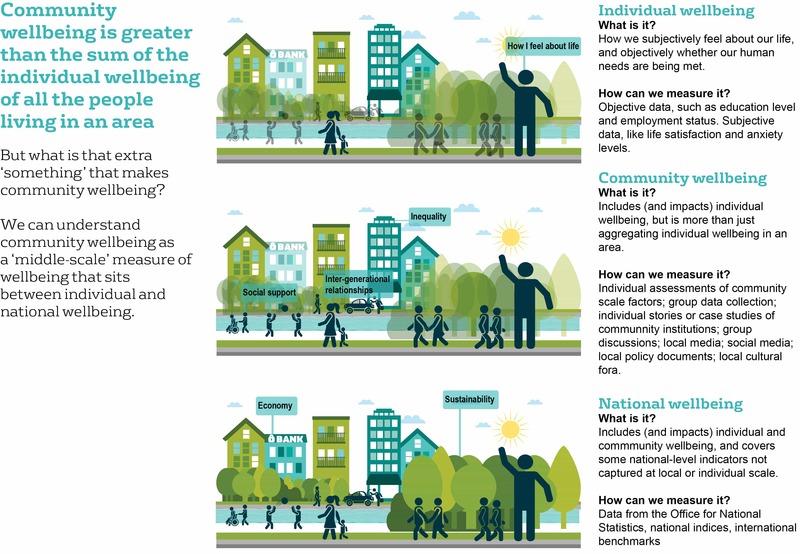 If so, is the working definition of community wellbeing useful as a starting point? What is missing? If you used them, did you find the questions above useful? What else is needed to support the conceptualisation of, or development of community wellbeing? You can get in touch with us on info@whatworkswellbeing.org, tweet us @whatworksWB or get in touch via Facebook or LinkedIn. Guest blog: The benefits of healthy advice?